The CEO of a high-stakes player in the aerospace industry decided to land the business in Tucson based on its high-profile neighbors, including Raytheon Missile Systems. He’s an entrepreneur who founded StratSpace, managing and engineering firm in Tucson. He’s also been chief technical officer for Moon Express, a privately funded lunar resource company in California. Vector is a microsatellite launch company that’s producing smaller rockets for frequent and relatively inexpensive launches. It is located in a growing corridor of aerospace ventures near Tucson International Airport. 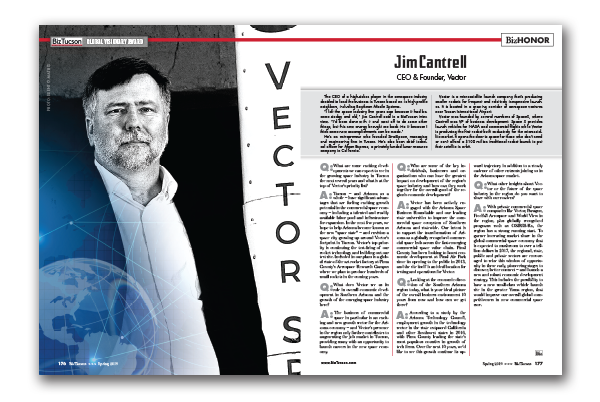 Vector was founded by several members of SpaceX, where Cantrell was VP of business development. Space X provides launch vehicles for NASA and commercial flights while Vector is producing the first rocket built exclusively for the microsatellite market. It opens the door to space for those who don’t need or can’t afford a $100 million traditional rocket launch to put their satellite in orbit. Q: What are some exciting developments we can expect to see in the growing space industry in Tucson the next several years and what is at the top of Vector’s priority list? A: Tucson – and Arizona as a whole – have significant advantages that are fueling exciting growth potential in the commercial space economy – including a talented and readily available labor pool and infrastructure for expansion. In the next few years, we hope to help Arizona become known as the new “space state” – and envision a space city growing up around Vector’s footprint in Tucson. Vector’s top priority is continuing the test-firing of our rocket technology and building out our test site. Included in our plans is a global state-of-the art rocket factory at Pima County’s Aerospace Research Campus where we plan to produce hundreds of small rockets in the coming years. Q: What does Vector see as its role in overall economic development in Southern Arizona and the growth of the emerging space industry here? A: The business of commercial space in particular is an exciting and new growth sector for the Arizona economy – and Vector’s presence in the region only further contributes to augmenting the job market in Tucson, providing many with an opportunity to launch careers in the new space economy. Q: Who are some of the key individuals, businesses and organizations who can have the greatest impact on development of the region’s space industry and how can they work together for the overall good of the region’s economic development? A: Vector has been actively engaged with the Arizona Space Business Roundtable and our leading state universities to improve the commercial space ecosystem of Southern Arizona and statewide. Our intent is to support the transformation of Arizona as a globally recognized commercial space hub across the fast-emerging commercial space value chain. Pinal County has been looking to boost economic development at Pinal Air Park since its opening to the public in 2013, and the site itself is an ideal location for testing and operations for Vector. A: According to a study by the Arizona Technology Council, employment growth in the technology sector in the state outpaced California and other Southwest states in 2016, with Pima County leading the state’s most populous counties in growth of tech firms. Over the next 10 years, we’d like to see this growth continue its upward trajectory in addition to a steady cadence of other entrants joining us in the Arizona space market. Q: What other insights about Vector or the future of the space industry in the region do you want to share with our readers? A: With private commercial space companies like Vector, Paragon, FreeFall Aerospace and World View in the region, plus globally recognized programs such as OSIRIS-Rx, the region has a strong running start. To garner increasing market share in the global commercial space economy that is expected to mushroom to over a trillion dollars in 2017, the regional, state, public and private sectors are encouraged to seize this window of opportunity in these early, pioneering stages to discover, better connect – and launch a new and robust economic development strategy. This includes the possibility to have a new small-class vehicle launch site in the greater Yuma region, that would improve our overall global competitiveness in new commercial space race.